CENTARA HOTELS & RESORTS is offering a beach holiday package at selected oceanside resorts that includes the option of three or five nights accommodation along with a number of benefits designed to ensure a value-added holiday. The Life’s a Beach package is available at Centara properties in Krabi, Phuket, Hua Hin, Samui, Koh Chang and Trat. The package is valid from now through to March 31, 2013. Cost of the package varies according to the property, room type and the season, but always includes daily buffet breakfast, a 60-minute massage or spa treatment for two, complimentary roundtrip airport transfers, welcome cocktails, and a beach bag as a practical souvenir. Examples of the rates for afive-night stayareBHT 20,990 for a Tropical Suite at Centara Chaan Talay Resort & Villas Trat; BHT 25,600 for a Superior room at Centara Koh Chang Tropicana Resort; and BHT 41,120 for a Superior room at Centara Grand Beach Resort & Villas Hua Hin from Jan. 11 until Feb.28, 2013. All packages are on the basis of two adults sharing, with up to two children under the age of 12 years and sharing their parents’ room and bedding receiving accommodation and breakfast free of charge. An extra bed is available in the room for either an adult or child at an extra payment, which includes breakfast. The package is not applicable to group reservations and reservations for meetings, incentives, conventions, and exhibitions and does not include taxes. AWAY SUANSAWAN CHIANG MAI, a resort property within the Centara Boutique Collection, has completed the upgrading that includes a new private terrace for each of the rooms. 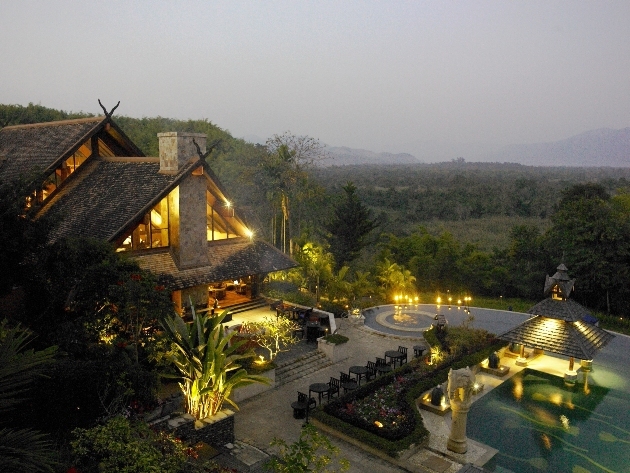 The resort, set in an extensive garden estate in the Mae Rim Valley, has a total of 47 rooms and villas and offers a retreat for couples and families who wish to enjoy the Chiang Mai countryside. “We are very much a resort where guests come to relax away from the daily routine, and consequently they spend a lot of time within their accommodation and enjoying the grounds,” says Away Suansawan General Manager Peter Brown. Each of the Garden Rooms now has its own terrace, measuring between six and eight metres and equipped with new teak garden furniture. The window sizes have been made larger to provide more natural light, soundproofing has been added between adjoining rooms, the new TV sets have wall-mounted 32-inch LCD screens, and new teak room furniture has been provided. Away Suansawan Chiang Mai, Centara Boutique Collection is set in grounds with more than 1,000 trees, a lake, three fishponds, and several garden areas. 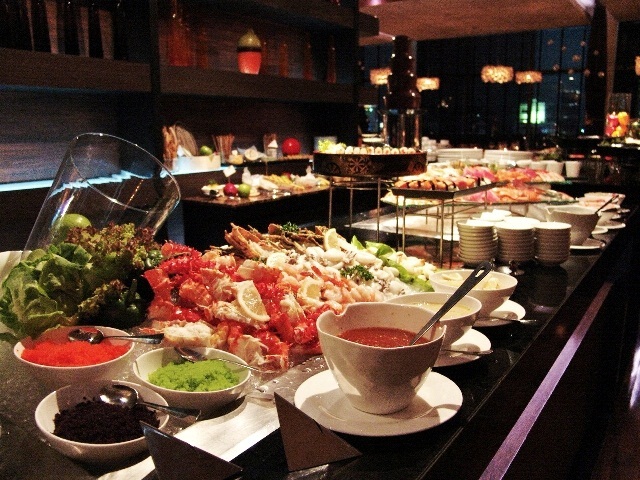 Escape restaurant serves international, Thai and halal cuisines. Facilities include Cense by Spa Cenvaree, a fitness centre with sauna, and a lakeside relaxation sala. The resort is designed for those who wish to get away from city life and the daily routine, and enjoy fresh air and the beauty of the Chiang Mai countryside. It’s especially popular with guests who have an interest in trekking, exploring and soft-adventure activities, with elephant and horse riding, a water buffalo camp, boating and river cruises, mountain bike riding, off-road buggies, go-karts, paint ball and Zorb ball, and river rafting all within easy reach of the resort. For more information and reservations, contact call 66-2-101-1234 ext 1 or e-mail reservations@chr.co.th. JOIN MANDARIN ORIENTAL DHARA DHEVI, Chiang Mai on Dec. 31 to celebrate New Year’s Eve on the hotel’s majestic Khong Kao Lawn. The evening kicks off with an international buffet dinner, music by contemporary Lanna band Changsaton, and includes an elegant Lanna fashion and dance show and a midnight countdown complete with fireworks. Guests can book a minimum stay of three nights over New Year’s Eve with rates starting at US$1,100 (THB 33,833) per night in a luxury Colonial Suite and receive daily breakfast for two at Akaligo Restaurant, as well as the Mandarin Oriental’s Lanna Renaissance New Year’s Eve dinner for two on Dec.31 with one complimentary bottle of champagne per couple. THE ASIA PACIFIC SPA & WELLNESS COALITION has been named Spa Association of the Year at the 8th annual AsiaSpa Awards in Hong Kong. It is the fourth time APSWC has received the award. Andrew Jacka, APSWC chairman and director of the Thai Spa Association, reported that since APSWC’s last annual forum in 2011, it has been refocusing on its original objectives of providing education and strategic planning. It has also developed a new website in the past year. What are your biggest challenges or obstacles in running your business? What are your top three goals this year? What is the one big thing you feel you need to have or do that you think would help you double your business this year? What strategies have you tried to improve your business? What worked? What didn’t? Association of Malaysia Spas, Australian Spa Association, Bali Spa & Wellness Association, Malaysian Association of Wellness & Spa, Nippon Spa Association, Spa Association Singapore, Spa & Wellness Association of Singapore, Spa & Wellness Association of Nepal, Thai Spa Association and Philippines Wellness & Spa Association. In 2012, the Thai Spa Association conducted a seminar on Preparing your spa for AEC 2015 and has been actively involved with the Thai Ministry of Tourism and Sports in drafting an ASEAN spa standard that would be implemented in 2015. 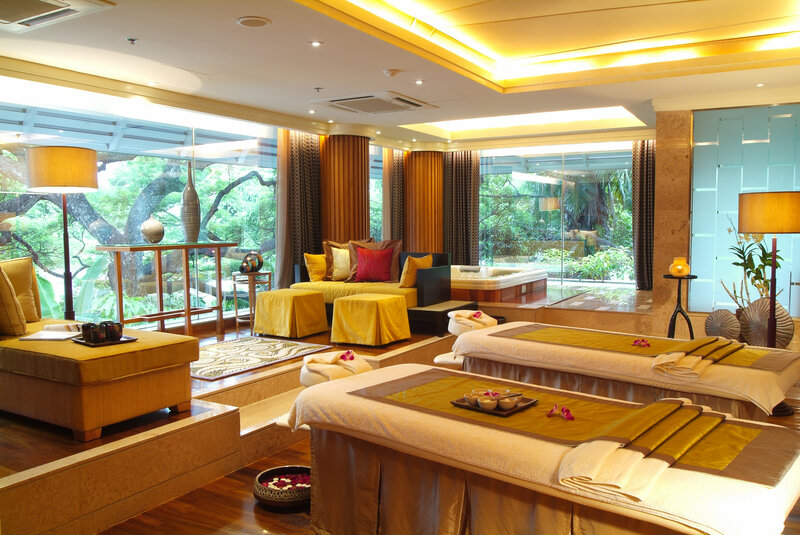 Andrew also announced it would be expanding its highly successful World Spa & Wellness Convention in 2013 from three to four days, set for Bangkok from Sept. 18-21. The event not only features the World Spa & Wellness Convention but the World Spa 7 Well-Being Congress, and the second Thailand Spa & Well-Being Awards. The first even attracted almost 4,500 visitors from 35 countries and saw 19 custom-designed trophies awarded in 18 categories. THE CHEDI CHIANG MAI is offering a special rate on two-night stays from now until Oct. 31, 2013. The package includes two nights’ accommodation; welcome drink; daily breakfast for two; a choice of either a 150-minutge The Chedi Oriental Ritual or 180-minute Siam Oriental Ritual; and private round-trip airport transfer by the hotel limousine. The Chedi Chiang Mai places a premium on privacy. It’s surrounded by a four-storey bamboo-clad wall and features amenities like floor-to-ceiling sliding glass doors at all of its 84 guest rooms as well as scenic views of the Mae Ping River, plus dining at its colonial British consulate-turned Thai, Indian and Western restaurant. From Dec. 1 – 23, 2012: Deluxe room – 22,800 Bht for single and 25,100 Bht for double occupancy; and Club suite – 34,900 Bht for single and 39,300 Bht for double. From Jan. 6 – March 31, 2013: Deluxe room – 22,800 Bht for single and 27,200 Bht for double; and Club suite – 30,300 Bht for single and 34,70o Bht for double. From April 1 – Oct. 31, 2013: Deluxe room – 20,700 Bht for single and 25,000 for double occupancy; and Club Suite – 26,500 Bht for single and 30,900 Bht for double occupancy. Club benefits include private check in at your room or at The Chedi Club lounge; evening cocktails with canapés; complimentary drinks in your room from the mini bar; and complementary laundry service. S Medical Spa in Bangkok. SPAFINDER WELLNESS PREDICTS an explosion of new “wellness everywhere” hotel chains and environments becoming more mainstream in 2013 and beyond. It’s one of the top 10 trends SpaFinder Wellness sees in its 10th annual spa and wellness trends for 2013. It goes on to note that established hotel chains are rebranding around wellness, and not just about fitness. Customized food and beverage offerings, including gluten-free and vegan menus, are becoming standard, with hotels jumping into “the juice-themed vacation frenzy”. SpaFinder’s full 60-pahe plus report will be release on Jan. 15, 2013. Susie Ellis, president of SpaFinder Wellness and industry expert, noted that when the company’s first trend report was issued a decade ago, the industry was in a different era. Each year the SpaFinder Wellness Trend Report is developed by company research analysts, led by Ellis who is also the chairman and CEO of the Global Spa & Wellness Summit. The forecast is based on ongoing surveys with spa and wellness businesses and stakeholders around the globe, thousands of travel agents and hundreds of thousands of consumers. What’s more, this demand is expected to grow in the years ahead as the world continues to shift from a manufacturing to a service economy – and people, health care institutions and even governments recognize the effectiveness of spa/wellness programs and experiences. Rather than lying on the massage table with a mind full of chatter from the stresses of the day, the Mindfulness Massage uses breath work and techniques such as “body scans,” where attention is brought to every part of the body and the action of the therapists’ hands. This two-way symphony, directed by a therapist who understands mindfulness, offers guidance on how to take the massage to a new “mindful” level. Earthing — As modern-day humans become more cut off from nature, “earthing” specifically refers to the movement promoting direct contact with the earth’s electron-rich surface (walking barefoot, etc.). Spa-Genomics…Telomeres and Beyond – Humans have 30,000 genes and a three billion-letter DNA code. The future of medicine is mining this information to identify breakthrough approaches to support a new age of predictive, personalized medicine grounded in each person’s unique genetic profile. “The power of direct-to-consumer genomic testing lies in the potential to pinpoint which diseases/issues could be forestalled by specific lifestyle changes. It’s easy to see how the spa industry is a natural benefactor of this development, but perhaps no genomic breakthrough holds such profound implications for the spa industry than telomeres – the only malleable part of DNA, which some studies are showing can be repaired by stress-reduction, exercise, sleep, healthier food and meditation. Absolute Sanctuary on Koh Samui. Authentic Ayurveda and Other Ancient Revivals – Expect more aggressively authentic and comprehensively executed global wellness experiences at spas with a distinctly ancient look, feel and language – and a far more expansive, exotic menu of wellness traditions. Ayurveda, a 3,500-year-old Indian-born health practice, is a complex medical system identifying imbalances in a person’s “doshas,” and prescribing a personalized, detoxifying regime of diet change, exercise, meditation, massage and herbal medicine. Color Self-Expression – In 2013, “self-expression” will be most intensely played out around Color. Because color is easily applied and relatively inexpensive, self-transformation will be painted on. Inclusive Wellness –The bodies welcomed at spas in the future, the report predicts, will look more like bodies in the real world. With more than one billion people who are formally “disabled”, and a massively graying global population, the industry will shift focus from luxe-pampering to delivering wellness to persons of all age and ability levels. “More people will look to spas to heal and keep bodies functional, whether through pain-relieving and mobility enhancing therapies, nutrition advice, or the right forms of functional fitness for those with physical limitations or special needs. Label Conscious Fitness – The “name-brand” fitness wave has been around for decades. But today, as the fitness market expands as quickly as the world’s waistlines, an explosion of “fitness labels” not only distinguishes products and programs but serves as a shortcut for instant recognition in an over-saturated market full of similar choices. Health and wellness have become the new luxury. Men: From Barbers to “Brotox” – Dramatically more men – from Beverly Hills, to Berlin, to Beijing – are having more serious “work” done at medspas and plastic surgery offices, as injectables, love handle remedies and advanced new surgery technologies make for little downtime and telltale scars. ANANTARA GOLDEN TRIANGE RESORT & SPA at Chiang Rai in northern Thailand has received three notable awards for its philanthropic, eco-friendly and sustainability endeavors. The first was Condé Nast Traveler’s 2012 World Savers Awards, which celebrates support of local communities and the protection of our precious planet. The hilltop retreat won the top Wildlife Award and was runner up in the Preservation Section. The second, the 2012 HICAP Sustainable Hotel Awards, recognizes Asia Pacific hotels that demonstrate exemplary environmental and cultural best practices. The resort won the Sustainable Destinations category. The third, the Hospitality Eco Friendly Green Resort/Hotel 2012 Silver Magellan Award, wasmade by Travel Weekly. The resort’s eco achievements include recycled wood and locally sourced materials to refurbish pre-existing buildings, tree planting and wastewater treatment initiatives, as well as enforcement of non-hunting and fishing regulations to create a haven for native species. The resort’s Golden Triangle Asian Elephant Foundation (GTAEF) was set up in 2005 to rescue Thailand’s street elephants. The onsite Elephant Camp is now run as a unique scheme whereby the elephant and mahout are rented at a steady income in return for participating in Camp activities. Owners of animals who cannot work, such as babies, pregnant females and those who have suffered injuries, are also paid. Working closely with the Thai Elephant Conservation Centre (TECC), safety, care and activities all exceed national and international standards. Elephants are guaranteed fodder, shelter and insurance. The mahout and his family receive food, housing, medical insurance, English lessons and schooling for their children, while mahout wives receive 100% of the profits from a traditional silk weaving business. The Elephant Camp now supports more than 30 elephants and 60 people, and is fully self sufficient. In addition to elephant activities, funds are sourced via charitable guest donations as well as the annual King’s Cup Elephant Polo Tournament, which funded the world’s first ever Thai Elephant Therapy Project for autistic children. The resort is also working with Cambridge University on research into elephant intelligence. Elephants are empathetic and know why they have to cooperate with their mahouts. The hope: By studying their behavior, scientists will better understand how elephants interact not only with mahouts but in the wild. THERE IS NOTHING like a romantic surprise to make a holiday unforgettable, and the three Sand Sofa dinner options offered by Centara Koh Chang Tropicana Resort. With its beachfront setting, the resort offers privacy along with the sand sofas, and with butler service, all three options are real barefoot luxury. 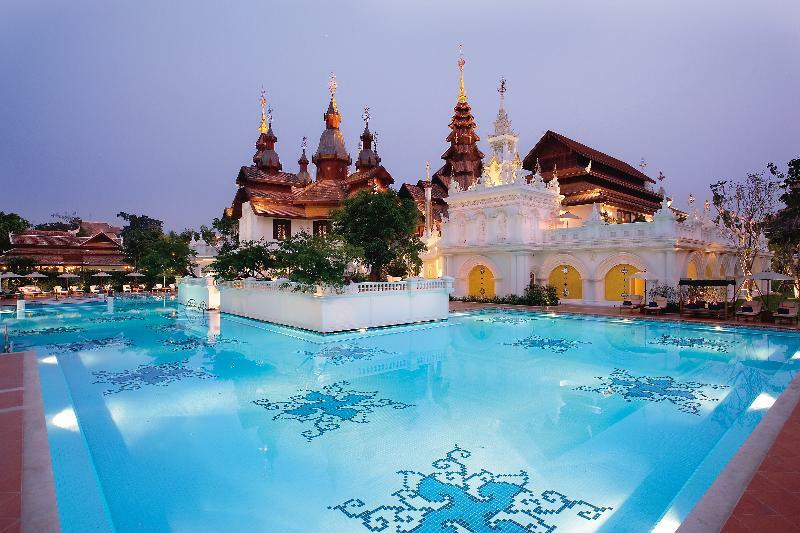 Each of the three options is for two persons, priced at Baht 950, Baht 1450, and Baht 1950 per person. 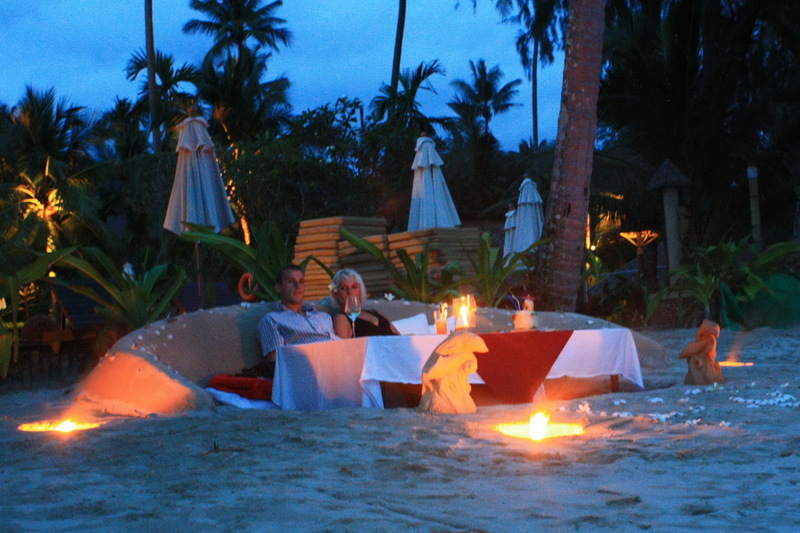 The Sand Sofas are prepared at sunset, with the table set with candles and flowers. Each Sand Sofa option offers the choice of a Thai or Western dinner, and depending on the option selected there is live music and entertainment. Centara Koh Chang Tropicana Resort is set on the white sands of Klong Prao Beach on the western side of the island, with its own beach frontage and with natural surroundings, with nearby forest paths, waterfalls, a fishing village and an elephant camp to explore. For more information and reservations, call 039-557 051.